Reflections for Sunday October 16, 2016. The 29th Sunday in Ordinary Time. All theology, all faith, is story – story as a reflection upon experience. This morning I want to reflect on prayer – particularly on intercessory prayer. We are a people who pray: consciously, instinctively, unconsciously, reaching toward the one who eludes us and yet is closer to us than breath itself. We remember the times of need, of desperation, of prayers that were a silent scream of anguish. We remember the times when our prayers have been the tired hammering at a door that just will not open; a reaching into a sky that remains blue, empty and implacable. Prayer can be that experience. To reflect upon that story is surely to be struck by his expense of energy and time, his sheer commitment over so many years – and the sense of disappointment at the outcome, or, to be blunt, what seems to be the lack of outcome. No results – or at least not the sort of results that he sought. We do not wonder that his initial response is to give up, abandon the desert and return to the world. But further reflection, an inner voice or a voice from God or a spiritual director reads the story differently – and draws attention to the extraordinary persistence and courage of the hermit as a sign of the presence and activity of God. That is a theological and spiritual reframing. We start to realise that prayer is different to what we thought it was about. That prayer involves what might call dispossession – we have to relinquish notions of control and ownership. We’ll come back to that – but consider the story in the gospel for today. We can imagine the judge: a man in a position of power and totally absorbed in himself. Against him is the widow who seeks justice but he decides to hear her case and give her justice only because she keeps pestering him. What we see is, on the one hand, indifference and, on the other hand, unrelenting, tireless, persistent commitment. This is a parable that shows us something of what faith in action may look like: it is unrelenting. A question that might lurk in the background of the parable concerns the nature of the magistrate and God: is God like the Magistrate – indifferent to our pleas? Does God have to be nagged into response or compliance? Is that what our prayers are like – an endless battering of heaven with our petitions until God relents and acts? That is a dreadful thought. From our finite ‘outcomes’ point of view prayer can feel like that. We pray for X to be healed and X dies anyway; we pray for peace in the Middle East or for an end to the conflict in Syria, and nothing seems to change; we pray for social justice in a very inequitable society, and we feel the weight of the world pressing upon us and little seems to change. Is this when we should give up? The woman in the parable does not: but she continues to press her case. 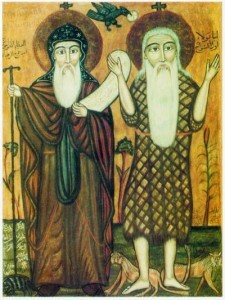 The hermit in the story from the Desert Fathers, persists regardless and despite the lack of obvious outcomes. These are stories that make us revisit and reconsider our life of prayer. The deeper we engage with prayer the more we become aware of how we are trapped by our human obsession with power, privilege, control and achievement. Our needs, our pathologies, overpower us. In our anxieties we distort our relationship with God as we articulate our requests and foreshadow the desired answers. Instead of an honest petition or conversation, we want to shape and manage what happens. However prayer resists that impulse: intercession surely acknowledges our recognition of the needs of others and our own relative powerlessness in respect of their future; in prayer we acknowledge our incompleteness and our yearning as we hold the world before God. Intercession (for the world, others, and ourselves) brings us to the edge of how we think and speak of God: we must persist but there is no management or control. All prayer, intercession as well, draws us to the limits of how we dare to speak or imagine God. In Iris Murdoch’s novel Henry and Cato, the character at the centre, the priest and scholar Brendan, explains his realisation of what such persistence involves.